Fox Gallery is an unique jewelry and gift store located in downtown historic Germantown, Ohio. Fox Gallery is owned and operated by Tom and Julie Fox since November 2004. Tom designs, creates and repairs jewelry in both 14K Gold and Sterling Silver. Julie runs the gallery and creates exquisite beaded jewelry. Fox Gallery carries many interesting jewelry pieces in 14K Gold, Sterling Silver, Copper, Brass, Dichroic Glass, natural stones and gems. We can help you find the perfect ring for your special day with traditional or custom made engagement rings and wedding bands. 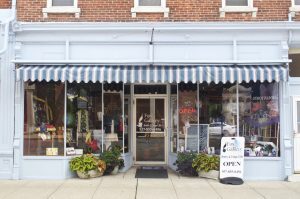 Along with beautiful jewelry pieces, Fox Gallery also carries unique gifts such as amethyst cathedrals, rock and mineral specimens, fossils, candles, and women’s apparel. Fox Gallery also carries national brands. Please call if you are interested in a certain item from these companies. If it is not in stock, we will be happy to order it for you.